If you’re a ginger lover like me, there’s nothing more refreshing than a big pitcher of my lemon ginger elixir on a hot summers day. Throughout the summer I almost always have a pitcher of lemon, lime, or cucumber scented water in the fridge, but on the weekends when I have a bit more time on my hands adding some extra ingredients makes me feel like I’m splurging. Who says a fancy cocktail needs to be loaded with sugar or alcohol anyway? Although I enjoy a “real” cocktail on a special night out from time to time, I love to play around with alcohol free concoctions and save my calories for real food. I make a faux mojito with limes, fresh mint, and sparkling water that’s super delicious, but unlike a real mojito you won’t get in trouble for bringing it to the office! My lemon ginger elixir is practically calorie free, and contains no artificial sweeteners so enjoy it because it not only tastes great but is also really good for your body and soul. 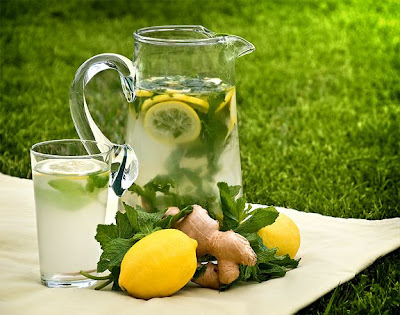 Start off with sparkling water for fun, but when you run out refill the pitcher with filtered tap water one or two times to get more mileage out of your ginger, lemon and mint. With each refill the flavor will become less and less intense, but a soak overnight in the fridge is surprisingly fruitful. Oh… and I like to either strain it through a fine mesh sieve or drink it through a straw to avoid big chunks from going in my mouth. In a large glass muddle together the lemon, mint, and ginger until they have released their juices. Add the contents of the glass to a large pitcher. Rinse the glass with some of the sparkling water and pour into the pitcher. Fill the pitcher with the remaining sparkling water. Serve cold or over ice. This looks so refreshing ... you know I am not a fan of ginger, but I am willing to try this. Beautiful picture as always! You know how to make it look like summer time! I have been craving lemonade all afternoon haha. This has just sent me into overdrive! Looks amazing.